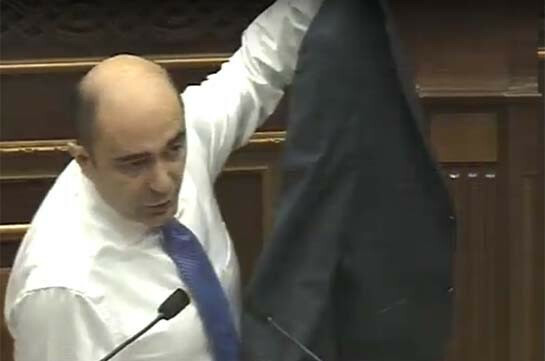 Bright Armenia faction head Edmon Marukyan criticized the bill on making structural changes in the government. The opposition lawmaker also stressed that the promise given by the Prime Minister has not been kept. Marukyan reminded that candidate for premier’s post Pashinyan had stated that the NSS and the police would become ministries becoming part of governmental structure. Marukyan presented their option of the changes, according to which Home Affairs Ministry and National Security Ministry is to be created. He stressed the NSS’ investigative system must be moved to Investigative Committee, the same he says, refers to the investigative department of the State Revenue Committee. “The system you are offering is the system of Serzh Sargsyan – you are taking two buttons from a costume and believe you have made changes. By taking these two buttons you leave the premier as head of the NSS and the police,” Marukyan stressed. In new Armenia, according to Marukyan, all the ill systems must be eliminated and all must be accountable before people which is possible only through the parliament. “Now tell me why Nikol Pashinyan’s promise has not been kept, why after the year since the revolution you cannot orient how our state governance system may become open, democratic and accountable,” Marukyan stressed.